Kitchen renovation designed by Lisa Tharp. Yacht-inspired. Holly + Teak boat decking countertops. LaCornue range. Sailboat mast inspired pendant lights. Custom yacht counter chairs in leather and oiled walnut. Articulating faucet. Map-reading sconces. Hi Gail. Thanks for your question. The chairs were custom commissions from Richard Wrightma, a brilliant furniture studio. Here you can see how the range, the photo of the diver above it and the subtle vent hood serve as a focal point. They are flanked by two pendant lights that Tharp chose because of their resemblance to a proud sailboat’s masts. The other appliances are concealed behind cabinetry panels. 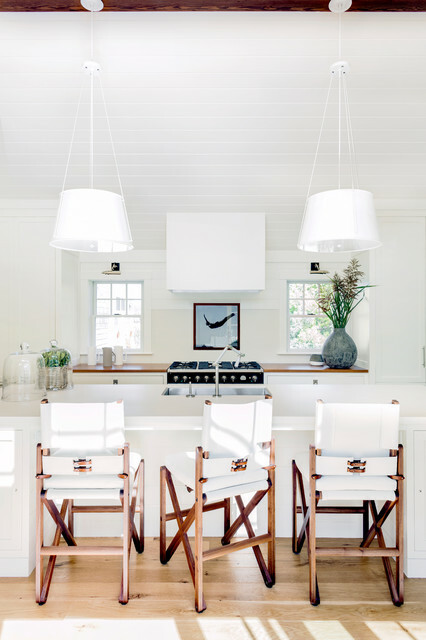 Guests can enter off the patio and sidle up to the island to keep the cook company and have a drink. The stools have a clever leather detail on the backs. She had them custom made to bring in a campaign furniture look, something you’d find on a yacht like The Bloodhound.Chairs: custom commission from Richard Wrightman; island countertop: Neolith; faucet: Kohler; range: La Cornue; pendants: Darryl Carter for Urban Electric Co.